Based on the assumption of a 40-hour work week, employees spend nearly 25 percent of a given year at the office. As a result, the appearance and atmosphere of an office is key for employee happiness and retention. “Equipment and decor can influence productivity and mood, and the floor plan can facilitate the flow of energy and ideas,” contributor Jerry Jao wrote in Forbes. Even if operating on a tight budget, it’s important to allocate enough resources to establish a comfortable environment that lends itself to efficient and effective workflow. Though it may not seem like an immediate need, Jao asserted that improving the office is actually an investment for the future. A study published in the World Applied Programming journal found making atmosphere a priority and subsequently making positive adjustments resulted in higher employee self-esteem, better reactions when giving and taking criticism, more group cooperation and a stronger desire to take responsibility. Offices are often little social ecosystems or a communities that are dependent on company culture. Shared values, practices and beliefs define a company’s personality and how it interacts with the greater business environment. Companyculture.com says good organizational or company culture is one that balances benefits for the business and the people who work there. A positive company culture can bring about higher morale, more motivation, better attendance and result in greater financial returns. In a survey conducted by the American Society of Interior Designers that focused on recruiting and retaining employees, physical space was determined to be among the top three influential factors. Though compensation took the lead by a large margin, benefits and physical workspace essentially tied for second with 22 percent and 21 percent of the votes, respectively. Those employees confirmed that the design and layout of an office contributes enough to job satisfaction that they would consider taking a job with a favorable atmosphere or leaving a job that is less comfortable. Some survey responses said physical space is valuable because it influences their ability to be happy and comfortable; they are in the office a lot and they are more productive in a satisfying environment. Aspects that were listed as desirable traits for an office are bright lighting, new furniture and equipment, easy access to coworkers and supplies, the ability to personalize workspaces, and level of noise and privacy. Air temperature and quality were factors as well. When determining layout, a big decision is whether to have open seating or cubicles. This partially depends on the industry but each setup has inherent qualities that contribute to workflow. Open seating is best when fostering collaboration and teamwork. It also encourages face-to-face communication. On the other hand, cubicles are useful when an office is divided by departments. They may be the more logical choice if an employee’s job requires privacy or they are dealing with sensitive information. One way to improve appearance and air quality simultaneously is the introduction of plants. They add life to the office, literally, while removing carbon dioxide from the air and releasing oxygen. Many offices have an area for employees to take breaks where there is a television or game collection for them to use as de-stressing agents. 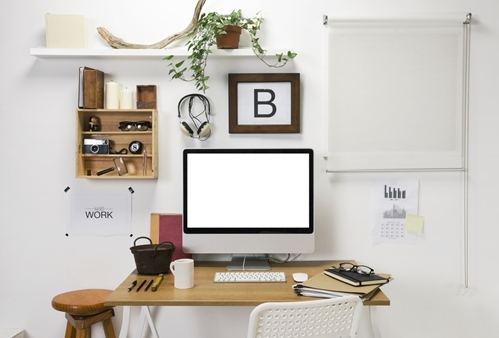 Encourage employees to dress up their work space, whether it be with pictures of friends and family or a trendy organizational unit next to their computer. Consider supplying personalized calendars or personalized mugs to employees for splash of company pride in their workspace. Making adjustments to the company space has a litany of benefits but ultimately, the best accessories to an office are a genuine smile and positive attitude.